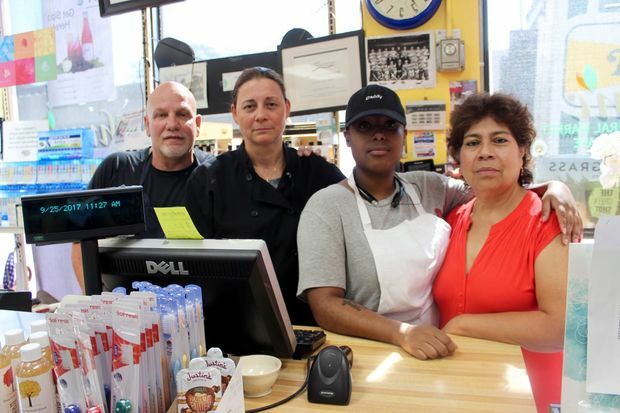 Nathalie Reid (second from left), who owns Thyme Natural Market, and her employees, hope the LIRR bridge won't be demolished. QUEENS — Owners of several mom-and-pop businesses along the crumbling Long Island Rail Road bridge in Kew Gardens hope they will be able to avoid the wrecking ball. The MTA said Monday it is planning to conduct an engineering feasibility study requested earlier this year by the community to see if the aging structure on Lefferts Boulevard in the heart of the neighborhood can be saved. The bridge, which was built more than nine decades ago, includes the roadway owned by the Department of Transportation and two LIRR-owned platforms supporting the rows of stores, such as a fish market, bagel shop and accounting office. In recent years, the structure has become a hazard as its facades and walls began falling apart, putting residents and passing trains at risk. In June, a local engineer suggested building a new concrete deck beneath the current structure, which would support the stores, while eliminating the need to destroy the bridge located between Austin and Grenfell streets, near the Kew Gardens Cinemas. Aaron Donovan, a spokesman for the MTA, acknowledged that in order for the buildings to stay, the decks have to be replaced. Store owners said they hope the study will work in their favor. “I’m very hopeful that our stores will stay here. This is what the community wants,” said Muhammed Arif who runs Reo Chemists, adding he built his pharmacy “from scratch" nearly four decades ago. The MTA considered demolishing the stores, and later mulled over commissioning a developer to figure out what to do with the structure, prompting concerns that new high-rises could replace the 13 businesses currently located along the bridge. Following an outpouring of support from the local community, MTA representatives met with local Councilwoman Karen Koslowitz earlier this summer and the agency agreed to conduct the study, which would evaluate whether it's possible to build a deck allowing the buildings along both sides of Lefferts Boulevard to remain in place, the agency said. Koslowitz said she would pay for the study. Initially, she was planning to do it through her City Council capital funds, but last week she found out it was not possible. The MTA said it was no clear at this point if the agency was going to solicit bids from engineering companies to do the study, or it would select an engineering company from its pre-approved list of firms it has already worked with, the agency said. “We just hope that the MTA can understand that we are not out to get them, we just want them to take responsibility for what is rightly their responsibility," said Nathalie Reid, who owns Thyme Natural Market. Local residents determined to fight for the bridge and local businesses have created The Save Kew Gardens Coalition in May and launched an online petition on Change.org which had more than 3,760 signatures as of Monday.